UUUHHHH MMYYYY GOOODDDDSSSS!!! I just freaking LOVED this book. It was incredibly over the top sweet. It was the type of book that made you feel all warm and fuzzy and just wanted to give it a hug, and curl up with it giddily to consume and devour. It was such a fun and pleasurable successful summer read. 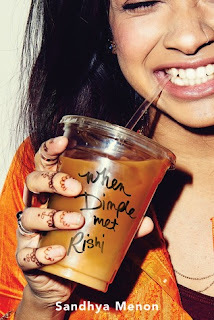 Dimple is an Indian American recently high school grad obsessed with web development. Rishi, also Indian American and recent high school grad, is obsessed with doing the right thing. Rishi's parents and Dimple's parents arranged for the two to meet and get to know one another while working together on a summer web development program. Completely unbeknownst to Dimple. Dimple is over the moon excited. Rishi is only there for Dimple and to follow in the path so perfectly laid out by his parents. Of course Dimple is a rebel. She refuses to wear her mothers make up, ditch her glasses, or straighten her hair unnecessarily because her worth is in her amazing personality, her passion, her drive, her openness. I loved how much Dimple just wanted everyone to live up to their potential. Herself. Her roommate and new bestie Celia, and especially Rishi. The book sets off to show how against Dimple is to listening to anything her mother tells her. She even seems a little bratty. In comparison to Rishi who is happy to go along with his parents plan for his life. As the story progresses, both have to learn to balance their own hopes and dreams for their lives with the path their parents want them to take. Dimple comes to understand her mothers point of view. And Rishi learns to go after what he wants, even if it's a little scary and not perfectly set. Their love story is so cute! Rishi is head over heels in love with Dimple almost right off the bat. But it doesn't feel like insta love. I don't think I'd be down for this arranged marriage either. Every love story is different. Rishi loved Dimple but didn't even know her. He kept trying at first from duty to his family, not because she seemed particularly interesting, cool or pretty. So I absolutely loved Dimple. She only agreed to continue spending time with Rishi because she liked his characteristics. Until she fell in love with him. Not because her parents bullied her into it. A great testament to Diversity. I love how proud Rishi was of his heritage. How he gladly took every opportunity to showcase it. Dimple as well, who disagreed with the rigid lines for women still respected and valued her culture. I'm so happy I read When Dimple Met Rishi. Yay I'm glad you loved it! Great review! I'm so excited to read this one. It was really good and worth the read, you definitely should check it out. Thanks for stopping by! I completely agree with you about how the book makes the reader feel all warm and fuzzy! The book was just so adorable and sweet. It's definitely of one my favorite books this year.